Honestly, you don’t need me to tell you about G.L. Pease tobacco. Once you dive headfirst into the intoxicating realm of pipe smoking and fine artisan tobacco, you quickly become familiar with G.L. Pease. Over the last couple of years I have had the privilege to learn more about and work in the production and retail side of pipe tobacco. 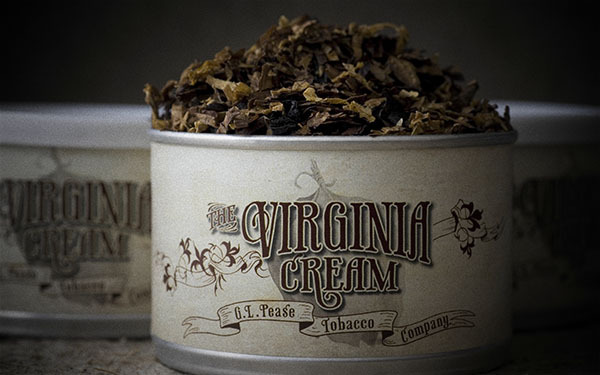 I can tell you, with complete honesty, that Virginia Cream was one of the most anticipated and exciting tobaccos being released near the end of 2015. After hearing that the producers of this tobacco had immediately fallen in love with it, I knew this blend was going to shoot up to the top of my Review list. It is with great dissatisfaction that I missed it. When it was released to the market on October 14, 2015, I had forgotten to order. And by the time I remembered it was too late. My go to retailer did not have them in stock. It wasn’t until four days ago that I finally got my hands on a tin. And while I HATED waiting, let me tell you something…for this blend, it was worth it. My yearning to try this new style aromatic tobacco was paid off in full when I got my shipment. Actually is was paid off in just one bowl. So let’s get some business out of the way. Quick positives: this is an affordable blend. It is a small batch tobacco, blended with care and specific recipe by Cornell & Diehl. The thickly packed ribbon cut is easy for moving to a jar and packing. Quick negatives: the tin art is a bit lame. Tin note is dominated by the small of bourbon (although some of you may think this a positive). And most certainly not least, my tin has an odd bend, it causes the lid to not fit snuggly. This is probably a freak occurrence, but it is an honest critique of my experience. So now that those are out of the way, a more detailed impression is in order. As I hinted at in the beginning, this is a different style of aromatic tobacco. It is not some oily, syrup soaked concoction, ready to jump at the chance to bite your tongue. Virginia Cream is a blend that has been doused with intense concentrated flavors, allowing it to remain dry and cool to smoke. G.L. Pease’s creation is a celebration of Virginia tobacco. The Virginia leaf used has been flue-cured. Flue-cured means the tobacco has been aged above a heat source where the smoke has been removed. This process keeps the natural flavors detectable in the tobacco, it creates a more potent blend, but most importantly it keeps the tobacco from acquiring an undesirable smoky flavor. To “spice” things up a bit, a little dash of Perique and Dark Fired tobacco was sprinkled in. The aromatic flavor in this tobacco comes from it’s sauce. Made from vanilla and bourbon, this tobacco promises a smooth and bubbly flavor. What the bourbon flavored sauce most definitely adds is an incredible tin not. As soon as you pop the tab, you are guaranteed to pick up the buzz a glass of bourbon would normally give you! For me, this strong alcoholic note was overwhelming. I didn’t like it. But I am betting there are some of you that would be in stark contrast with me. I am from Kentucky. I proudly bleed blue. Us Kentuckians are known for three things: basketball, horses, and bourbon. I love basketball. I know nothing about horses. And if I could choose one other subject/topic to write about, it would be bourbon. I am sure many of you have a fine and sophisticated respect for bourbon. To picture what it is like smoking Virginia Cream, imagine you are taking a cool drive in Autumn through the bluegrass state. You feel the slight sting of brisk air on your cheeks as you slowly roll down the windows of your vehicle so that you can light a bowl. Where are you going? Well you and a few of your buddies just happen to be taking a long trip through the bourbon trail. In your mission to grown your appreciation for the art of proper distilling, you acquire this sense of freedom, this love of life. The only reason you have this chance, this specific opportunity to go on an adventure, is because of the beauty of bourbon. That is the best way to describe Virginia Cream. As soon as you take a match, or a lighter if you please, to the tobacco, draw, and exhale, you are slammed with the clear oaky flavor of the spirit. I don’t know if I have smoked a higher quality tobacco that has a clearer taste of alcohol than this. Through all my fun description of bourbon, I need not forget to talk about the blends other flavors! The other added component, vanilla, adds more of a texture to the tobacco and less flavor. What the vanilla does is equivalent to sandpaper on briar. It smooths out the blend. This is crucial to the tobacco. Without it, bourbon would be cutting through every palate out there. Another great feature of this pipe tobacco, or at least in my opinion a great feature, is the fact that it burns quickly. Before you know it, you have to nock out the ash and then your smoke is gone. There are two reasons I love this: 1) it makes the blend perfect for the busy working many. Many of us do not have time to mess around with a 20 minute bowl of tobacco. We got things to do! It is nice to enjoy a tobacco that doesn’t burden us with commitment but still smokes great. 2) Virginia tobacco and alcohol flavoring can both, when used incorrectly, cause tongue bite. A short smoke reduces the chance of bite. I am sure no one is going to complain about that! An article from G.L. Pease informs us how this tobacco got its name. During an early taste test, a lucky onlooker stated that the room note smells just like a delicious Italian cream soda. Hence the tobacco was deemed Virginia Cream. In my personal opinion, the room note could be much better. Yes it smells good. Yes my wife likes it. Yes it made my car smell wonderful after it. You know what else smells good? Walmart brand candles. As good as it may be, it will never hold a flame up to a Yankee. There is just a long list of aromatic blends that smell infinitely better than Virginia Cream. I don’t think there is anything wrong with this blend. But as an aromatic, which it most definitely is, it should smell better. Alright, no surprise here. You should drink a stiff glass of bourbon with Virginia Cream. Even if it doesn’t enhance the flavor, the spirit of this tobacco demands it be paired with bourbon. Some of my favorite bourbons are Knob Creek, Woodford Reserve, and Angels Envy. I believe any of these would pair nicely. But say you actually want to pair this with an appropriate drink, one that will compliment and build up the flavors of the tobacco. If this describes you, then I suggest mixing yourself a sweet lemon vodka martini. The lemon cuts through the sticky flavor the bold bourbon flavored Virginia while the sugar will sooth and cool your mouth in case you are prone to tongue bite. And vodka is key. What you don’t want is a strong spirit battling with the bourbon flavored tobacco for dominance. If you have ever smoking a Cornell & Diehl blended aromatic tobacco, you know what to expect. But in case you haven’t, let me warn you. They are not always for the faint of heart. Many smokers seem to think that aromatic style tobaccos are defined as being light and easy palatable. The truth is that an aromatic tobacco is just one that has been artificially enhanced to improve aroma. 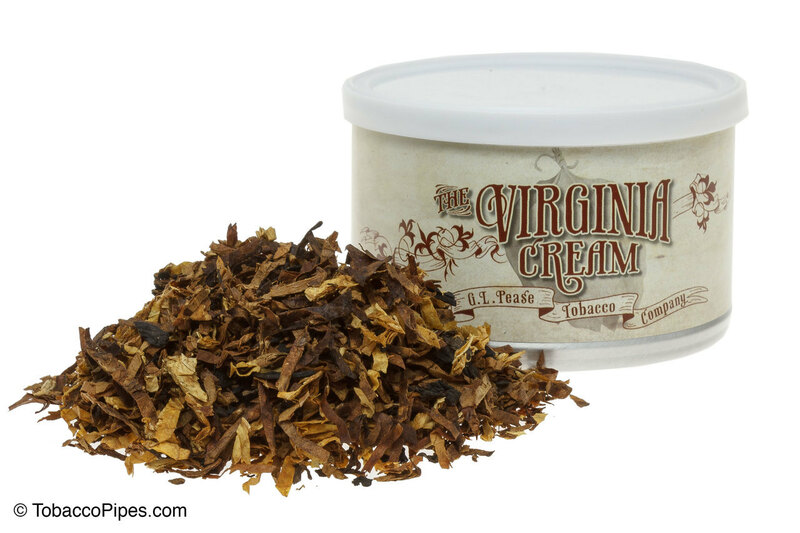 Virginia Cream is one of those blends that may challenge light smokers, but is easily handled by the seasoned vet with a leather tongue. Basically, it’s perfect for everyone. There is no one out of the radius of taste or body for Virginia Cream. Virginia Cream has a medium bodied strength. I was satisfied with how the blend hit me. There was no part of it trying to knock me out, but it wasn’t shy either. I will say that I was under impressed with the volume of smoke I got form the blend. This is no indictment on the blend, I just think it is more fun when I have a bit extra smoke for my rings. In review: this tobacco tastes delicious, but can sometimes overwhelm the smoker with the flavor of bourbon. It takes the smoker to a place of drunken euphoria, where it does not disappoint. It has an intoxicating aroma, but not one that lives up to the expectation of an aromatic. As I mentioned above, I really do love this tobacco. It was not one I had to make myself smoke five times before I reviewed it, I actually looked forward to every bowl I filled, and even now, sitting here on my old lazy-boy, I look forward to stepping out on may balcony and taking out another bowl! I give Virginia Cream a score of 7 out of 10. Even though I enjoyed this more than a seven, I can’t ignore some of it’s problems. The bourbon is just way too strong. If this blend was lightened up, say more vanilla and less bourbon, then it would stand as a better aromatic. Or even in the other direction. If there was an extra-heavy dashing of Perique, or more Dark Fired, then it would transition to a Va/Per or American blend. I believe it would have much more success there. Buy this tobacco. Fill up a bowl as soon as you can and experience tobacco done right. This fine tobacco is available online at great sites like TobaccoPipes.com. Images provided by TobaccoPipes and G.L. Pease. Very down to earth, honest review. Absolutely. I appreciate the comment and the follow! Good review. Most of your reviews always make me hunt down that particular tobacco and try it. Well that is nice to know! I am glad that I am highlighting good tobaccos on the site, not just bashing gunky ones. Thanks! Excellent review! I’ve been waiting to hear your thoughts on this blend. I almost bought a tin of this on my last online order, but will make it a priority for my annual IPSD order. I have yet to try a Pease blend, so this might be my first. Any quick suggestions for others? And I enjoyed your description of Kentucky. It takes me instantly to my trips visiting my wife’s family in Lexington and wonderful memories there. Thank you. I have mixed feelings about GLP tobaccos. There are some I love and some I hate. Quiet Nights is a good GLP English. Sixpence is another good choice that w ton of smokers like. I think those two are good representations of GLP’s tobacco. Thanks for the recommendations. I’ve heard a lot of praise for Quiet Nights and Sixpence. I will definitely keep them in mind!